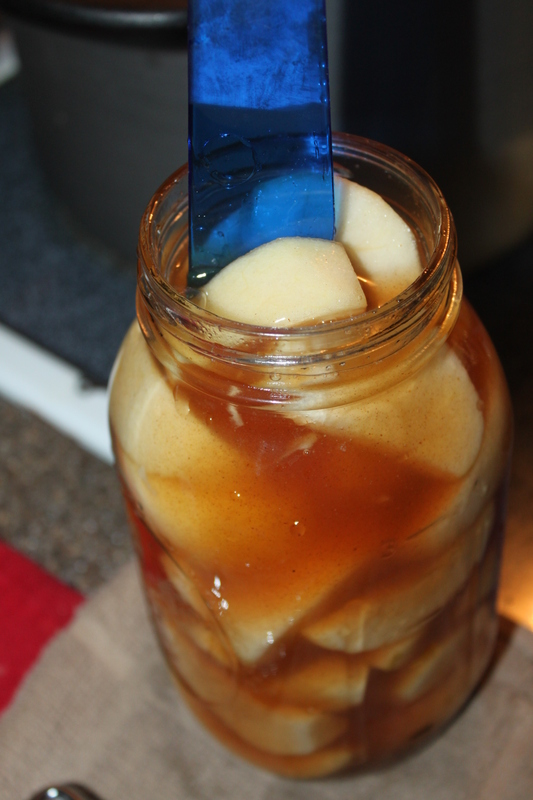 Apple Pie Filling Recipe - And How To Can and Freeze Too! Who can resist the taste (and smell) of a Fresh Apple Pie? It is a family favorite in our house and is a highly requested dessert when we get invited to holiday and family gatherings. Apple pie filling ready for the canning pantry, just in time for the holiday season. Although we make the majority of our pies in November and December, now is the time to prepare the filling from fresh picked apples. Having the pie filling in the canning pantry is not only a huge time saver during the hustle and bustle of the holiday season, but the taste of truly homemade pie filling is unbeatable! Northern Spy apples make a great pie apple because of they are tart and juicy –Don’t forget seconds are perfect for apple pie filling! There are many apples that can be used to make great apple pies. The key is t0 find tart, crisp and juicy apples that won’t lose their shape when baked. Good apples to use include, but definitely are not limited to: Fuji, Gala, Granny Smith, Jonathan, and Honeycrisp. This year, I was happy to find Northern Spy apples. 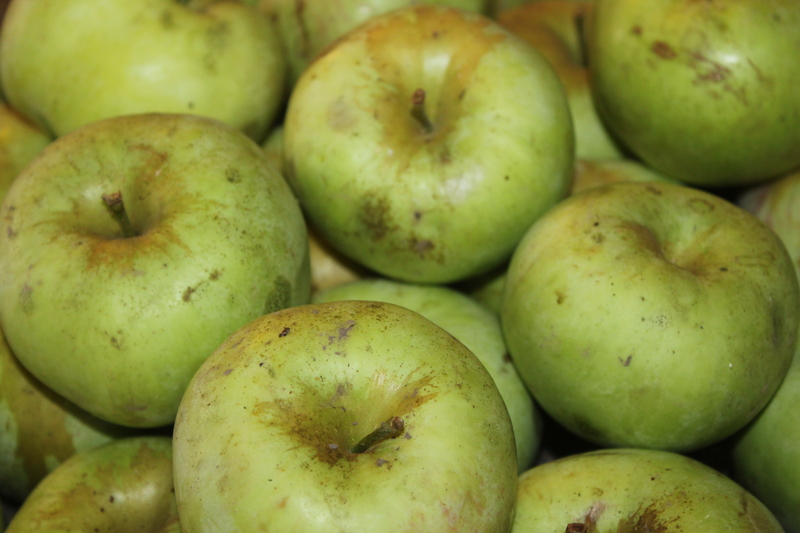 They are heirloom apples that do well in colder climates, ripen in October, and can be stored for up to 3 months. Last year the apple crop got severely damaged by a late season frost, and we were only able to get a handful of Northern Spy apples. So needless to say, this year, I was excited when I was able to gather a whole box. And if you don’t make that many apple pies in a year, don’t worry. 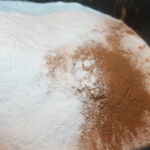 You can use this filling for toppings on pancakes, ice cream, and even to use in tarts and apple crisp. But please don’t forget to save a jar or two to give away as a gifts – your friends and family will thank you! *Clear Jel replaces cornstarch for classic apple pie filling canning recipes. Corn starch is not considered safe for the canning process, however Clear Jel thickens the sauce and has been found safe for canning methods. Just a side note – this is NOT the same thing as Sure-Jell — we found Clear Jel at a local Mennonite based store in town. 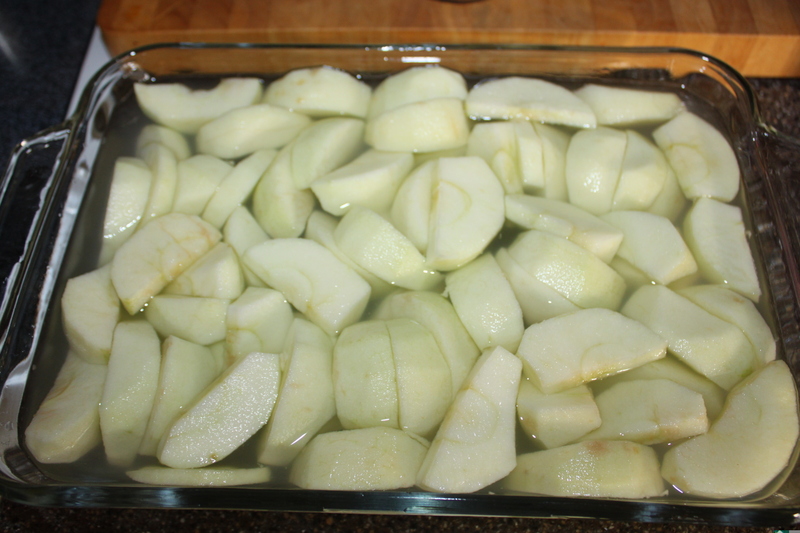 Apples peeled, cored and sliced dipped in lemon juice and water to prevent browning. 1. Wash, peel, and core apples. Prepare slices 1/4-1/2 inches wide and place in cold water containing 1/4 cup lemon juice for every 4 cups water to prevent browning. 2. Mix spices, Clear Jel, and sugar in large saucepan and add water and juice. Cook until it reaches a boil, stirring constantly. Boil for one minute, remove from heat. 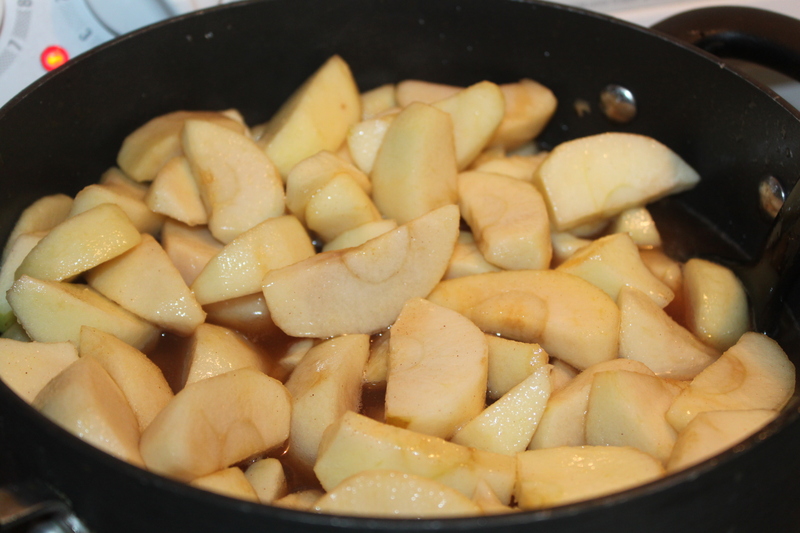 Apples folded into syrup mixture and being heated. 3. Place sliced apples directly into the liquid. Stir to coat. Return to heat until apples are heated through. 4. Pour heated apples into a quart jar. Once apples are layered to reach one inch head space, add the liquid. Remove air bubbles by sliding a plastic utensil down the inside of the jar, adding liquid as needed to continue to leave at least 1 inch head space. It is very important to remove air bubbles down the inside of your canning jars. You can also freeze pie filling. Fill freezer containers (or an unbaked pie crust), exclude air, and seal. To make pie with canned pie filling: Fill unbaked crust with filling (one quart per pie). Put dabs of butter on top and add a top crust. Bake pie at 425 degrees F for 15 minutes, reduce heat to 350 and bake for an additional 35-45 minutes or until pie crust is golden brown and liquid is bubbling. Wash, peel, and core apples. Prepare slices 1/4-1/2 inches wide and place in cold water containing 1/4 cup lemon juice for every 4 cups water to prevent browning. Mix spices, Clear Jel, and sugar in large saucepan and add water and juice. Cook until it reaches a boil, stirring constantly. Boil for one minute, remove from heat. Place sliced apples directly into the liquid. Stir to coat. Return to heat until apples are heated through. Pour heated apples into a quart jar. Once apples are layered to reach one inch head space, add the liquid. Remove air bubbles by sliding a plastic utensil down the inside of the jar, adding liquid as needed to continue to leave at least 1 inch head space. 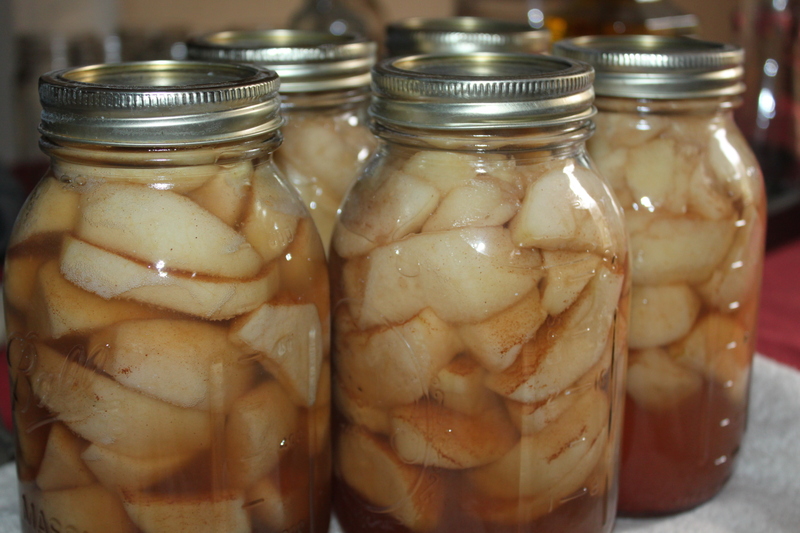 Clear Jel replaces cornstarch for classic apple pie filling canning recipes. Corn starch is not considered safe for the canning process, however Clear Jel thickens the sauce and has been found safe for canning methods. Just a side note - this is NOT the same thing as Sure-Jell -- we found Clear Jel at a local Mennonite based store in town. oldworldgardenfarms October 4, 2013 September 2, 2018 Apple Recipes, Desserts, Recipes, Sauces Dressing Jams Misc.